Much of my research is currently related to the relationship between the object, image and text, in particular the way the Internet has influenced and perpetuated translations between different media formats. Previously, I discussed how the ephemeral, narrative and networked nature of postcards can be likened to some extent to the blog post, which led me to consider how my work relates to the phenomenon known as Post-Internet art. 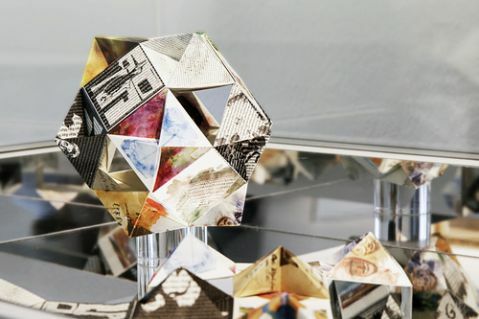 There have been a number of different definitions used to describe post-internet art, including dimensional artwork that uses the aesthetics of the net eg. web browsers, glitches, programming language, through to the possibilities of image sharing afforded by sites such as tumblr and instagram. All of these definitions however, conform to an overall understanding of the term which is discussed in Artie Vierkant’s 2010 essay The Image Object Post-Internet, in which he details the history and development of the concept. Although people have expressed problems with the term as a sequential description, the ‘post’ in this sense refers to the idea of creating ‘after’ the internet, with the internet as a priori which contributes to the production of dimensional media. In this way, post-internet art uses technology as a tool, a network or a concept, rather than a medium – in the case of net art or new media. My interest in the term is not necessarily in defining my work, but in how it describes a particular trend in my practice between my use of the internet and the making of object-based art. Despite, the objecthood of Post-Internet art, it may still utilise the internet as a medium for dissemination, as with Dissociations, the web documentation of Berlin-based artist Harm van den Dorpel’s studio practice. Similarly, in the work of performance artist Paul Kindersley, the web as both form and concept are addressed through his series of videos mimicking YouTube makeup tutorials which are then uploaded to the video sharing site. These propositions suggest various correlations with my work, through the use of social media in curatorial projects, research into online image archives as inspiration for my practice, and sharing my writing online. In considering the definition of Post-Internet art, I hoped to find a strategy to understand how the different aspects of my practice fits together, and how I can tackle some of the more problematic issues of appropriating cultural objects. However, despite the contentious term, I feel like I have found some affinity with the idea, which is expressed in the last section of Vierkant’s essay. I’ve been reflecting on the term ‘partial connections’, which I discussed in the previous week, in relation to working with postcards in my practice. The term, which explores the meanings of objects produced by relational networks, is also reiterated to some extent by James Clifford in his 1997 essay, ‘The Museum as Contact Zone’. ‘Contact zones’, first coined by Mary Louise Pratt, refers to “social spaces where cultures meet, clash, and grapple with each other, often in contexts of highly asymmetrical relations of power…”. Within the notion of partial connections, Strathernian anthropology dictates that levels of complexity remain the same regardless of scale. Therefore, as Pratt’s undefined ‘social space’ becomes condensed into Clifford’s ‘museum’, so the site of the contact zone can be concentrated within a single object. Furthermore, within ethnographic practice, this object may also be represented by text or image translation. In trying to find links between my work and anthropological ideas of partial connections, contact zones and translation, I began to read Jacques Derrida’s 1979 book ‘The Postcard: From Socrates to Freud and beyond’. In the first section, Envois, he describes purchasing a large number of the same postcard with which to send letters to a loved one. Each entry is printed along with the date it was sent, as an epistolary novel. Although my interests in the work were initially related to the postcard format, I soon found links to other aspects of my practice, including autoethnography and online writing. The act of translation, through the sending, receiving and decoding of information, is also prevalent in the text. As I am reading the 1987 English version, there is a foreword with translation notes, which includes a glossary of terms to elaborate on the way that the translator, Alan Bass, understood the original French. Additionally, Bass traces the etymological networks of prominent terms within the text including ‘post’ as a noun, verb and prefix. 1. To display (a notice) in a public place. 2. To announce or publish. 3. To submit (a message) to an Internet message board or blog. 4. (Brit.) The official service or system that delivers letters and parcels. 5. (Brit.) To send (a letter or parcel) via the postal system. 6. After in time or order. 7. Used in names of newspapers i.e. The Washington Post. 8. (in bookkeeping) To enter (an item) in a ledger. To record. 9. A position of paid employment; a job. 10. To send (someone) to a place to take up an appointment. mid 16th cent. : from French poste, from Italian posto, from a contraction of popular Latinpositum, neuter past participle of ponere ‘to place’. 11. A long, sturdy piece of timber or metal set upright in the ground and used as a support or marker. i.e. signpost, starting post, etc. These definitions, which focus around the act of sending, announcing, publishing, recording, etc, set up a correlation between the postcard and the blog post. This is reflected in Derrida’s work, through the open format of his postcard writings and the potential network of recipients of his text. The inclusion of Freud’s fort/da experiment as the (im)possibility of its arrival with the intended recipient, also produces the blog-post-card as contact zone between sender(s) and receiver(s).